A complete energy balance equation was estimated for the common octopus Octopus vulgaris at a constant temperature of 20°C, fed ad libitum on anchovy fillet (Engraulis encrasicolus). Energy used for growth and respiration or lost with faeces and excreted ammonia was estimated, along with total energy consumption through food, for six specimens of O. vulgaris (with masses between 114 and 662 g). The energy balance equation was estimated for the specimens at 10-day intervals. During each 10-day interval, food consumed, body mass increase and quantity of faeces voided were measured. The calorific values of octopus flesh, anchovy flesh and faeces were measured by bomb calorimetry. Oxygen consumption and ammonia excretion rates were monitored for each specimen during three 24-h experiments and daily oxygen consumption and ammonia excretion were estimated. It was found that 58% of the energy consumed was used for respiration. The amount of energy invested in somatic and gonadal growth represented 26% of the total energy budget. The energy discarded through faeces was 13% of consumed energy. 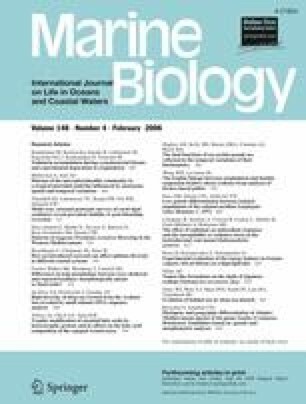 The estimated assimilation efficiency (AE) values of O. vulgaris feeding on anchovy (80.9–90.7%) were lower than the AE values estimated for other cephalopod species with different diets of lower lipid content such as crabs or mussels. Specific growth rates (SGR) ranged 0.43–0.95 and were similar to those reported for other high-lipid diets (bogue, sardine) and lower than SGR values found for low-lipid, high-protein diets (squid, crab, natural diet). Ammonia excretion peak (6 h after feeding) followed the one of oxygen consumption (1 h after feeding). The values of atomic oxygen-to-nitrogen (O:N) ratio indicated a protein-dominated metabolism for O. vulgaris. Research for this paper was partially funded by the Industrial Research Development Program of the General Secretariat for Research and Technology of the Hellenic Ministry of Development, under a contract with Nireus Aquaculture SA, (code 00BE407) and by the Research Committee of the National and Kapodistrian University of Athens. We thank M. Alexis and J. Negas (Hellenic Centre for Marine Research) for the provision of the bomb calorimeter used in the present study. The experiments for this study fully comply with the current laws of Greece and the EU.